Experts agree, sugar is a health destroyer. And with the average person consuming 300% more sugar daily than recommended and kids taking in 7 trillion calories of sugar from sodas each year, it seems more important than ever to instill a new dietary lifestyle. It’s the A) the unnatural amounts of sugar in food and B) the sudden increase in blood sugar levels that the body can’t cope with. This is why it is better to eat low-GI foods and limit carbohydrates, esp. refined ones, as well as sugar. My understanding is that he human cell needs sugar for the production of ATP or cell fuel. 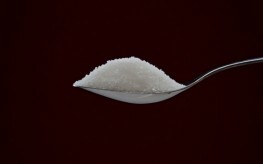 This article does not distinguish between simple sugars and complex/refined sugars. Yes eating cake and cookies and drinking cola is acid forming and not good for anyone whether they have cancer, diabetes, or not. However there are three simple sugars the body needs to thrive: Galactose(milk sugar), fructose(fruit sugar), and glucose(vegetable sugar). Galactose is no longer needed after two years of life as that is this time when humans should be weaned off mother’s milk. Humans also loose the enzymes to digest milk after this time. When the body is facing a threat like cancer or diabetes then fructose is the simple carb that it needs to repair and alkalize the cells. Yes one should eat raw fruit for the fructose. Not candy, corn syrup, etc.The human cell absorbs fructose without the need of insulin. If you “starve” cancer cells then you are starving all your cells. Not good when one is fighting to live. Also, what is the alternative one is to eat? high protein diet? high fat diet? That’s surely one way to have one’s cancer or diabetes flourish. This study goes against the nature of celluar biology…..cells need simple sugars to thrive. High fat diet is one of the most effective anti cancer diets but choose the fat wisely. I use MCT oil as a staple of my diet. Aim for 10 grams of carbs or less per day. Healthy vegetables are a free food and does not count toward your daily total. But I eat no starchy foods like bread grains potatoes and pasta. Cells live on sugar or on ketone bodies created from the fat we consume and store. Cancers consume sugar but can’t consume ketone bodies. So let’s feed the rest of the cells in our body but leave your tumor or cancer hungry and wanting more SUGAR and Fructose. To beat cancer a low carb diet, removing excess copper from your body and anti-angiogenesis therapy offers the most hope. Use pub med or similar to do your own research and let the clinical trials guide you. Most of the time yeah but sometimes moderation is not the answer. Some things are just poisons i.e. simple sugars. Would you be moderate with killing people? Sugar is sugar. The body makes no distinction between them. So whether you’re eating bread or cane sugar, pure fruit juice or lactose, insulin levels respond the same and the effects on the body are the same. High insulin levels have been scientifically proven to cause heart disease as well-not saturated fats as previously and erroneously thought. The bottom line? Your body does not need carbs in any of its forms-especially simple carbs that immediately convert to glucose which cause diabetes, obesity, cancer and heart disease. I tend to eat a lot of sugary foods and drink a lot of soda too. I'm trying my best to cut down my consumption because I'm aware of its ill-effects in the body. The question is, are they talking about Cane sugar, beet sugar or High Fructose Corn Syrup. And have the crops that go into each been genetically modified like Monsanto does? This article shows a picture of obviously "cane" sugar, yet the report does not make that distinction. More people are diabetic due to processed foods which all contain High Fructose Corn Syrup made with genetically modified corn which has been known to cause cancer. I think this report needs to go deeper and examine all aspects of this problem. HFCS is the culprit for the mass epidemic of cancer, let alone diabetes.